Boston Pickling cucumbers are a high yielding plant with a continuous harvest! Just like its name, the Boston Pickling is great for making pickles! This cucumber will grow to 3″ long and smooth with black spines. 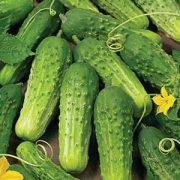 Cucumbers can be grown for fresh eating, pickling and more. They range in flavor, colors, shapes and sizes. Cucumbers can grow in circles, elongated spheres and more. 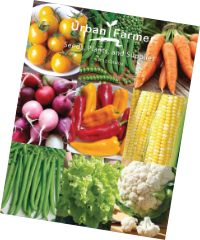 Before Planting: Requires warm, well-drained soil high in fertility, with a pH of 7.0 for best results. 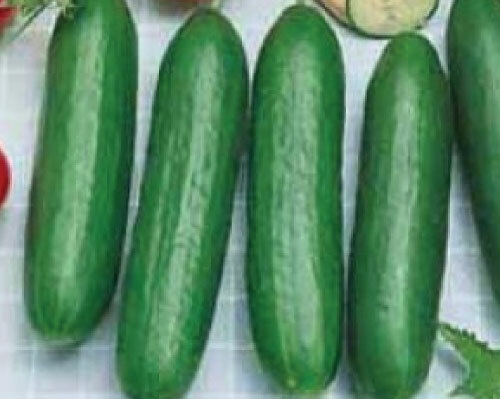 Consistent moisture is needed to produce an high yields of good size cucumbers. Cucumbers do not tolerate cold so sow after any possibility of frost has passed. Make sure both soil and air temperatures have warmed prior to planting. 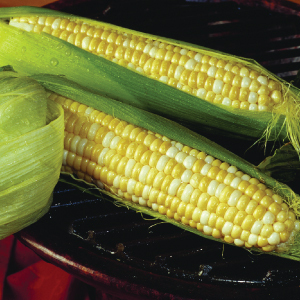 Planting: For direct seeding, wait until soil is warm, at least 70°F. Cucumber seeds will not germinate at a soil temperature below 50°F. Sow 2-3 seeds/ft., 1/2″ deep, in rows 6′ apart. Thin to 12″ apart. For transplanting, sow indoors in at 1-2 seeds per cell, 3-4 weeks before transplanting. Thin to 1 seedling per cell when true leaves form. Keep temperature above 70°F day and 60°F at night. Transplant 12″ apart in rows 5-6′ apart. Do not disturb roots when transplanting. Peat pots work best to reduce stunting and transplant shock. Watering: Water 1 inch per week. Water consistently, because inconsistent watering can create misshapen cucumbers. plant. Feed with fertilizer regularly. Days to Maturity: Once fruit bears, pick cucumbers often. They can double in size quickly. Tips: To maximize the amount of cucumbers and decrease leaves, use a trellis or tomato cage to grow the cucumbers. AVG. Direct Seeding Rate: 30 seeds/15′, 100 seeds/50′, 250 seeds/125′, 500 seeds/250′, 1,000 seeds/500′, 15M/acre at 2 seeds/ft. in rows 6′ apart.